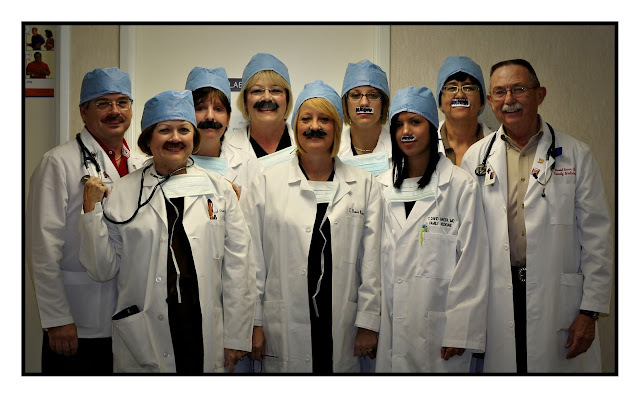 Dr. G. recently celebrated a birthday (on Halloween) and to celebrate, his staff dressed up as him - complete with mustaches, surgi-caps, coats and stethoscope! Some even completed the outfit with his signature cowboy boots! My sister works for him, and clued me in to this unique photo opportunity!!! It was just for fun, and all his patients loved it! What a fun fun fun thing to do!! That is too cute!! That is way to funny! Great shot. What a fun staff! Great moment captured! What a great day that must have been in the office. Cool shot. That is tooo funny, girl!